(Newser) – You can add one more name to the list of those claiming the Shroud of Turin dates only to medieval times. According to British historian Charles Freeman, Jesus' supposed burial cloth—believed by many to show his image after crucifixion—is a 14th-century prop that was likely used during an Easter-morning re-enactment of the resurrection. Freeman says his analysis of historical texts and illustrations has found no mention of the cloth before its first documented appearance in France in 1355, the Guardian reports. "Astonishingly, few researchers appear to have grasped that the shroud looked very different in the 16th and 17th centuries from the object we see today," Freeman writes in History Today. 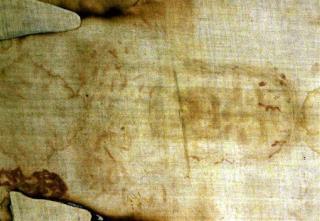 There, he examines "early depictions and descriptions of the Shroud that illustrate features now lost." In light of the evidence should Fox even post such an article on the Shroud? If I were a geologist (an authority figure) and claimed the moon was made out of green cheese would Fox News publish it? Unfortunately they would. Go see Barrie Schwortz's website www.shroud.com. Also check out the Hungarian Pray Codex, dated from 1192-1195, which PROVES the Shroud was at least a religious object that was venerated in Byzantine Empire prior to the Pray Codex dating.